I travelled to Kent to work with Horrify Me after applying to a casting he posted. I was extremely impressed with the planning and updates I was sent throughout the weeks before the shoot. I was given a safety briefing beforehand and was made sure I was comfortable to attempt the shoot. During the shoot I was given plenty of breaks and was very happy with how professional and smoothly everything went. Rick is a pleasure to work with and I would reccommend anyone to work with him. I wouldn't hesitate to shoot with him again, one of the best photoshoots and concepts I've ever participated in, thankyou!. Amazing amazing amazing!!!! I am soo happy I got to work with such a creative and amazing photographer ! I loved every second of today's vampire shoot! I would 1000% recommend Rick to anyone who loves blood and gore! So glad I had such an amazing opportunity today! I bought a voucher for my missus for her birthday for a suprise, as we'd both seen Rick's work on Facebook and we were both 'dying' to have the experience for ourselves! We arrived at the studio feeling a little nervous but we were soon put at ease with Rick's easy going nature and soon got into the swing of prepping and ageing the clothes we had brought (so much fun dirtying up with mud and other trappings of the Undead!) As the day progressed with make up and more and more blood the more fun we had! From gouging eyeballs to munching on limbs and innards there's something for every gore fest fan! Rick is a true professional and gets the best out of everyone he works with and with truly amazing results, you only have to look at his portfolio of pictures for proof. If you are a horror buff you have to experience the true spectacular awesomeness of Horrify Me!!! We will be returning for a sequel!!! 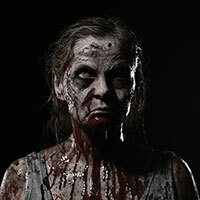 Our zombie photo shoot was an awesome experience, better than I could have imagined. It was so much fun & definitely a number 1 life time experience! Our printed canvas arrived and it is brilliant! Rick has done an awesome job at creating the canvas and giving us that real zombie experience. He made the day so enjoyable, a really talented guy! Big thank you to him, definitely recommend and hope to return for another shoot in future. Had the best day with Rick doing this photo shoot, we had no idea what to expect but he made us feel so comfortable from the first minute we walked in. The photos are amazing and I would recommend this to everyone! Huge thank you to Rick for making it so much fun and giving us a day we will never forget!! 'Would you recommend Horrify Me?' - Yes was not a strong enough answer, but thats all they would let me put. 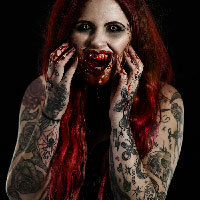 I had an awesome shoot with Horrify Me on Sunday, I have never met people more dedicated to their work and incredibly kind and considerate throughout. I had such an incredible time even though I was covered in chains and blood and special effect makeup! The team made the whole experience completely enjoyable and they really respected me on set, there was a changing room and convenient washing facilities! The photos I have already got back too are AMAZING - if I do say so myself. They do not only care for their photography, but their post production too. I would happily work with them again and give a private reference too! 5 bloody stars. Our experience was a family of 5, becoming zombies. It was fantastic! I bought this as a gift for my dad, and I couldn't have asked for anything more, it was the ultimate gift! Rick is extremely talented, and a very nice guy! Was an honour to meet him. He made us feel ever so comfortable and relaxed and just made it so much fun. Thank you again and we are recommending it to everyone we know. Not your standard photo shoot! I wasn't sure what to expect as I received this as a Christmas gift but having been to "normal" photo shoots before I can say the big difference here is the photographer. Rick is not some corporate snapper churning our mass produced snaps but is someone with a genuine interest in film and the horror genre in particular. 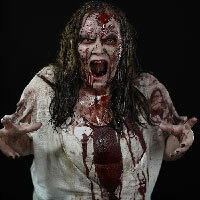 Preparing for the photos was great fun, ripping clothes, getting grubby and covered in fake blood. The make up was amazing even in the "flesh" and it was difficult not to laugh throughout! It was a long way for us to go but well worth the effort. Thanks Rick for a great shoot, thoroughly recommended. Ok, so I was nervous and honestly didnt know what to expect. But from booking the event all the way through to the current day (post shoot) I couldn't have been treated better. On the day I had my make up done professionally by Jodie Eastwood and she performed a miracle with my make up and knew what I wanted even when I didn't. Before the shoot I was walked through how it would go, what poses, how I would get covered in blood, the photo sets ups etc. Everything was agreed and outlined and very kindly done. Then came the time for the first set of frames to bear all. I was nervous I have to say but I had no reason to be, Rick put me at ease and explained the shoot and took the time to show me the images and took his time with getting the 'perfect picture'. Throughout the day I was put at ease, had cups of tea made, posed and was re-assured which of course grew my confidence and very soon any reservations I had were very much gone. When it was time for the blood Rick was so careful and concious of what he was doing and making sure not only did it look OK but he was being incredibly gentlemanly. Throughout the entire day from start to finish I never felt rushed either, it just took as long as it took. I didn't catch him look at his watch once... which never happens with any professional service. I have never done modelling / a photo shoot before and don't think I could have a 'normal one' done now, the photos I previewed looked amazing and for photos that by large should be 'gross' looking, they looked incredible. The buzz I felt post shoot and the confidence boost it gave me still hasn't worn off yet and I am not sure it will. Rick and his lovely wife have continued to be very giving and professional even post shoot I couldn't have asked for more. I have already started saving my pennies for the next shoot and can't wait to have the honour of being photographed by Rick again. If I could give Rick 100 out of 5 I absolutely would! My model and I drove for three hours to experience the magic of Horrify Me. We were greeted with a warm smile and a cup of tea and immediately fell in love! I simply cannot put into words how talented, inspiring, knowledgeable and downright lovely, Rick is. The entire experience was so much fun. Watching the scenes be set and images taken was so, so inspiring. This is a man with a clear vision and the incredible skill to bring these visions to fruition. The images are exquisite in their composition and excellent in quality. I would happily stop people in the street to recommend HorrifyMe and cannot wait to return, soon! !